Diane Feinstein, who was among those who demanded a supplemental FBI report on Judge Brett Kavanaugh, didn’t even bother to read it once it became available. She admitted as much during a very brief and grim-faced press conference earlier today. Senate Minority Leader Chuck Schumer also indicated he had not read it but rather had been “briefed” on the supplemental report’s contents. The reason for their disinterest? They already knew the report would bolster Judge Kavanaugh’s claims he did nothing wrong while proving there is little to nothing out there to substantiate the claims made against him. It was all politics—the life of an innocent man and his family be damned. The Establishment Media is already rolling out repeated calls for a “more thorough” investigation, claiming the FBI was too limited in the scope of its follow-up questioning even as Mitch McConnell is now pushing for a full confirmation vote for the Supreme Court nominee as soon as this weekend. Paid protests are set to be unleashed on communities all across the country—protests the FBI’s own information suggests is based on a pile of lies laid out by hyper-partisan Democrats fully engaged in the politics of personal destruction. The DNC is pushing hard to fundraise off of the manufactured controversy, likely confident Democrat voters prone to bouts of over-emotionalism will only be too happy to fork over money to a deceptive and losing cause. For Judge Kavanaugh now comes the waiting. Will enough Republicans and perhaps a few Democrats do right by their votes or will too many cower in the face of what will likely be intense paid opposition? Kavanaugh and America will know very soon. As the Senate awaits the results of the FBI investigation into the Supreme Court nominee Brett Kavanaugh, Jeff Flake, one of the lawmakers who spurred the inquiry, criticized the judge Tuesday for his recent appearance in the upper chamber. “We can’t have that on the Court,” said the Arizona senator, who didn’t elaborate on which interactions he was referring to. Earlier this week Flake attended a George Soros funded progressive rally in which the senator joked onstage about the staged confrontation in a Senate elevator that he used as an excuse to then ask for a supplemental FBI investigation into the baseless allegations made against Judge Kavanaugh – allegations legal experts have repeatedly asserted would never be taken on by any competent prosecutor. Rumors are now swirling that Senator Flake has already been promised a “good boy” package by Soros operatives that will comfortably feather his post-Senate nest in the coming years. 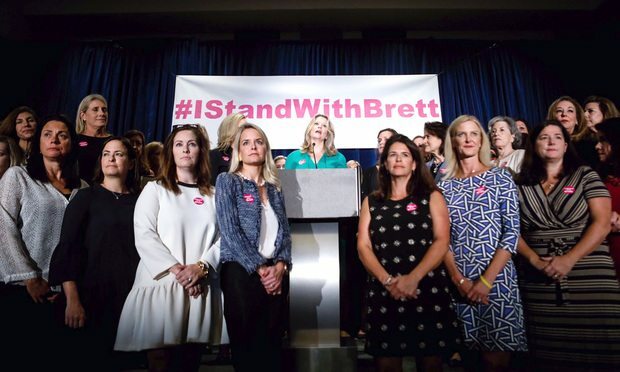 Democrats put on a shockingly divisive, abusive, and ultimately destructive, display before, during, and after the Judge Brett Kavanaugh hearings that has not only Republican voters disgusted but a growing number of Democrat voters feeling the same way. Will it impact the 2018 Midterm Elections? We shall see. Judge Brett Kavanaugh has long been highly regarded as a jurist of supreme knowledge and principle. Now he’s proving himself a father, husband, and man of supreme courage. Please take a moment to read and share his just-released letter to Congress. Help to inform others of the truth and demand the Senate confirm a right and honorable man to the Supreme Court. What the Democrats and media are attempting to do is destructive politics at its most insidious. America cannot allow them to win. As of this morning, President Donald Trump is shrugging off the overt smear campaign being waged against his latest Supreme Court nominee, Judge Brett Kavanaugh. “Judge Kavanaugh is an outstanding person, and I am with him all the way,” Trump declared while heading to the United Nations. The message to Congressional Republicans from the President is clear – locate your spines, shrug off the disgusting tactics of Democrats, and vote in support of Judge Kavanaugh. Trump commented on the unsubstantiated allegations as Senate Republicans prepare to hear testimony from Kavanaugh and Christine Blasey Ford, the woman who accused him of sexual assault more than 30 years ago. “He’s a fine man with an unblemished past. These are highly unsubstantiated statements from people represented by lawyers. You should look into the lawyers doing the representations,” Trump said. The president signaled frustration with the delay of the Senate vote and questioned accusations leveled against Kavanaugh. “There’s a chance that this could be one of the single-most unfair, unjust things to happen to a candidate for anything,” Trump said, dismissing “people coming out of the woodwork” with accusations against Kavanaugh after he was nominated to the Supreme Court. “In my opinion, it is totally political,” he added. Indeed. The very same kind of dirty D.C. politics that Americans are so tired of and a big reason they voted to make Donald Trump their president. Are Democrats Right To Think Women Are Stupid Enough To Believe The Lies Against Judge Brett Kavanaugh? Democrats in Congress are counting on the stupidity of women. You see, the allegation that Judge Brett Kavanaugh may or may not have flirted with a girl at a party nearly forty years ago while they were both in high school is absurd on every level. Democrats know it. The media knows it. The idiotic nature of the claim doesn’t matter. They are pushing the false ‘sexual assault’ narrative believing that most women are stupid enough, intellectually lazy enough, to merely read the false headlines and then neglect to actually learn the facts and thus be manipulated into voting against Republicans in the 2018 Midterms. As insulting to women as that might be, that’s the plan and they are no longer bothering to deny it even as more and more women from all walks of life are coming forward to express their full support of Kavanaugh’s appointment to the Court. House Democrats increasingly see the controversy swirling around Brett Kavanaugh as a political boon just weeks ahead of the midterm elections — a saga they think will energize female voters already put off by President Trump and threatening to bring their frustrations to the polls. To date, the accusations against a then-17-year-old Brett Kavanaugh are that he fell onto a bed with a high school girl (Christine Ford) at a party, she felt uncomfortable/scared, another boy jumped onto the bed with them, and they all then fell onto the floor laughing and giggling. 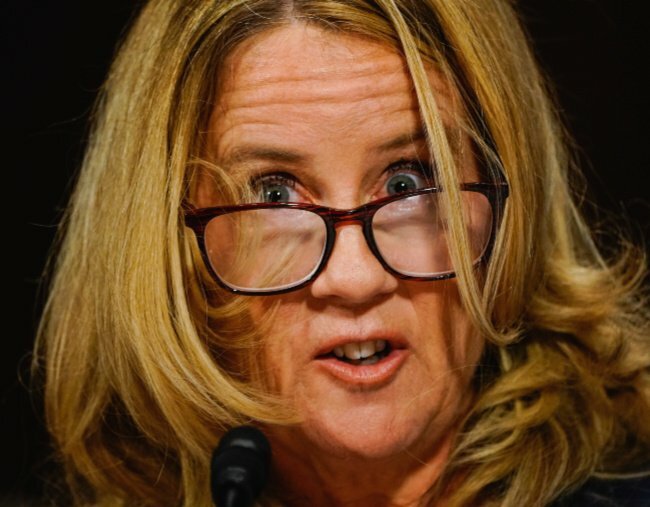 Ford left the room and never mentioned the incident for decades. (why would she? Nothing happened.) As an adult, she became a liberal professor and anti-Trump activist. Now, nearly forty years after the alleged incident, she’s making allegations of sexual assault against Kavanaugh as Kavanaugh is poised to become the nation’s next member of the Supreme Court. The timing of her claims certainly seems suspect. Democrats know the entire scenario is already a shambles of nothing. 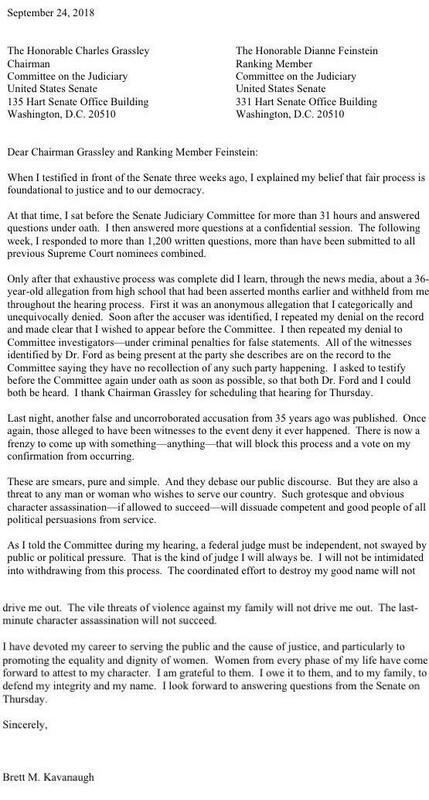 Even if the interaction between Ford and Kavanaugh took place as she now claims it did, does a very brief and clumsy attempt at a teen makeout session qualify as sexual assault? Not likely. Those who have bothered to learn the facts regarding the allegation are stunned that the allegation is being made at all. Again, Democrats don’t care. They are counting on women being stupid enough to believe what they are told to believe and to then go out and vote accordingly. Are you really as stupid as Democrats seem to think you are? Or, will you make them pay come Election Day for thinking so? D.C. Whispers shared rumors months earlier of some members of the Supreme Court who were suffering from increasingly poor health. Justice Sotomayor was among those discussed. This week news broke that Sotomayor fell in her home and broke her shoulder. Though among the youngest on the Court at 63, and appointed by Barack Obama when she was just 57, Sotomayor has appeared to have aged considerably in recent years. She suffers from diabetes and last year was the recipient of a 911 call after losing consciousness at her home. With this most recent medical malady, the rumors of her declining health are all but confirmed. It is another reason the many enemies of Donald Trump are so increasingly desperate to destroy his presidency. The prospect of him appointing one or more Supreme Court Justices scares the hell out of them. If Justice Kennedy does, in fact, step down the confirmation battle of his replacement will be epic. If you want the political news before it’s news bookmark D.C. Whispers today. Trump White House Preparing To Replace Liberal Supreme Court Justice? Whispers are rampant throughout D.C. that a vacancy is imminent on the U.S. Supreme Court – one that is currently taken by one of the most liberal members of the Court. It has the Trump White House giddy over the prospect of potentially and forcefully shifting the balance of power on the Court while Democrats in Congress are said to be warning White House staff of a prolonged and brutal fight should President Trump attempt to replace a liberal Justice with a hardline-conservative nominee. The first on the Court that comes to mind given those clues is 84-year old Justice Ruth Bader Ginsberg. 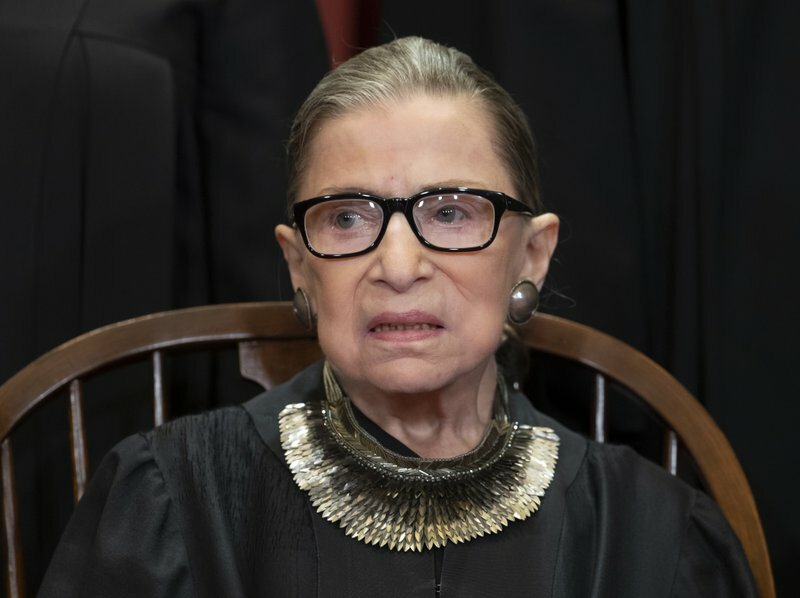 Justice Ginsberg has visibly slowed down a great deal in recent years, and has been prone to falling asleep in public, even when on the bench. 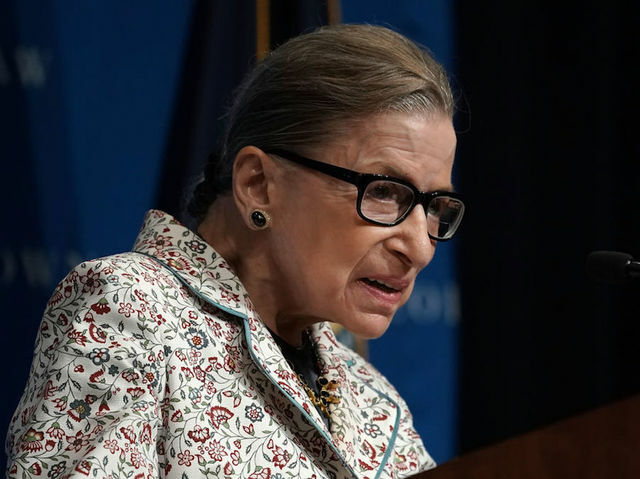 Ginsberg’s office has taken to pushing back on rumors of her health issues via a series of left-leaning media publications, but Court watchers have noted Ginsberg’s increasingly limited public schedule of late. Despite his 79-years, Justice Stephen Bryer’s place on the Court apparently remains secure, but not so with two others – swing-vote Justice Anthony Kennedy, 81, and liberal Justice Sonia Sotomayor, 63. Justice Kennedy, a moderate liberal (or moderate conservative depending on who you talk to) has already hinted at possible retirement, so he is not the likely source of the current Supreme Court rumors. Justice Sotomayor, though, despite being among the Court’s younger members, is said to be struggling greatly with her workload as she deals with a worsening diabetes condition. Court watchers have noted a visible decline in just the last year where she appears to have aged ten years. Rumors are also swirling regarding staff having to take up an increasing workload for the ailing Sotomayor who is said to have difficulty maintaining her train of thought for more than short periods of time. And like Ginsberg, Sotomayor’s staff is working hard to orchestrate a media-driven narrative to counter rumors of her decline. Here is the thought that is now keeping the far-left elites up at night. Justice Kennedy might very well be preparing for retirement. That would be one Supreme Court vacancy. And if the rumors of ill health regarding Ginsberg and Sotomayor are in fact true, that could be two or even THREE vacancies on the Court for Trump to fill within the next year or two.